Washington Monthly | Here Come the Syrians! Here Come the Syrians! Here Come the Syrians! Here Come the Syrians! We are all, of course, shocked and aggrieved by the terrorist attacks in Paris and what they might portend, and being “can do” Americans, we’d like to believe instant reaction will solve our problems. Perhaps the most satisfied man in America is Lindsey Graham, who can repeat his Captain Ahab of a demand for a large deployment of troops in Syria and Iraq without arousing contempt from those who remember the consquences of similar reasoning in 2002. But the dumbest reaction we’ve heard, by far, and it seems to be the most common from Republican governors and presidential candidates, is to treat Syrian refugees as putative terrorists, or worse yet, to distinguish them by religious tests. 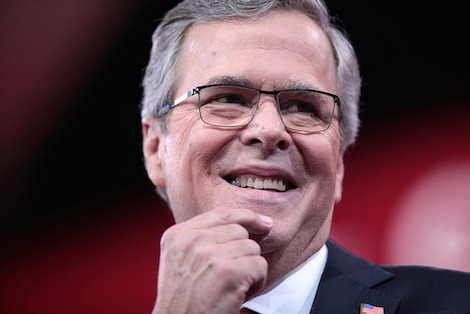 This last proposal is the signature “idea” of the Great Big Grown-Up and Establishment icon Jeb Bush. Ted Cruz, more predictably, thinks that’s an excellent suggestion as well. Aside from the message it would send to the whole world that Americans are happy to discriminate against the very people we are supposedly struggling to defend, vindicate and persuade, it’s not clear how this would work. Would Alawites, hated by ISIS as Muslim apostates, qualify as “Christian?” How about Shi’a? How about the Druse? None of them are Christian; none have any reason to do ISIS’s dirty work. What will we do to distinguish them all? Check men for circumcisions the way anti-Jewish and anti-Muslim genocidalists have done in the past? Maybe Jeb and Ted can volunteer for that duty.